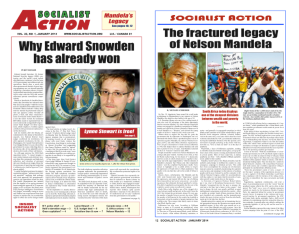 The following article is based on several portions of the Socialist Action (U.S.) Draft Political Resolution, which was approved at the Oct. 17-19 Socialist Action National Convention. By definition, global warming is a global issue. All will suffer the consequences of advancing climate change. International coordination of remedial efforts is vital. But, not surprisingly, UN-sponsored conferences invariably divide among “rich-poor” country lines—with a few, like China, cynically claiming a role in each camp. Impoverished nations are already bearing a greater burden from global warming, with the rising of seas and more frequent outbreaks of mosquito-borne infectious diseases disproportionately affecting tropical areas of the global South. Such countries also can least afford the services necessary to shelter and protect their populations, or the technology to transition to cleaner fuel sources. Their forests and minerals are ever more in demand for exploitation by advanced capitalist powers, adding to the ecological devastation and carbon emissions. 1) Much of China’s alarming pollution problem comes from production outsourced by American companies—with the products coming back across the Pacific to the USA in super-sized container ships. Along with jobs, American employers have also off-shored their fouling of the atmosphere. While China currently is responsible for about a quarter of the world’s total carbon emissions, even with all of the off-shoring the United States is still number two, contributing 17 percent. India (6.5%), Russia (5.1%), and Japan (3.7%) round out the present top five. In terms of per capita emissions, the U.S. is in a tight three-way race with Australia and Canada for top fouler. 2) The accumulation of greenhouse gases in the atmosphere has been building since the beginning of the Industrial Revolution. The leaders in shared responsibility over that time span are: the USA, 28 percent, China 9.9%, Russia 6.9%, Britain 5.9%, Germany 5.6%. Those who have profited from industrialization that created global warming over the course of two centuries have the accumulated wealth as well as moral obligation to pay the lion’s share of the costs of global remediation. Above all, that means the finance and industrial-capitalist ruling class in the United States. To the capitalist class, destruction of our biosphere is, at best, “collateral damage” in their ruthless pursuit of profits in a global economy that has become increasingly dependent on fossil fuels. In this sense, they see no alternative within the framework of a world order that prioritizes profit above human existence. We live at a time when the irrational and the inherent contradictions of capitalism portent a bleak, if not devastating, future for all life on earth. It’s not just the energy giants. There are more registered cars and trucks in the U.S. than there are licensed drivers. Plug-in electric vehicles, which could start to make a dent in domestic fossil fuel consumption if coupled with vast increases in the proportion of electricity generated by renewable sources, account for only about one half of one percent of new car production. An enormous amount of the economy, including tens of millions of jobs, is tied to the use of personal transportation powered by fossil fuels. According to the latest figures from the U.S. Energy Information, the USA remains the world leader in electricity generation; 39% is coal fired, 27% is natural gas, 19% is nuclear. Only 14% comes from clean renewables, over half of which is from hydroelectric dams. A paltry 4% of the nation’s electricity comes from wind and solar. Meanwhile, the suppliers of dirty fuels continue to rake in mind-blowing sums of money, with just the largest five oil companies making more than $90 billion in 2013. It’s no wonder that any talk of replacing the fossil-fuel industry’s source of astronomical profit with clean renewable alternative energy and transportation makes the class that rules very nervous. For them, the bottom line trumps any concern about future generations. Some sectors of the ruling class—typified by the now notorious Koch family—have opted for denial. They call climate change “junk science,” peddled by film-flam scientists looking to stuff their pockets with private grant money. Should we fall for this fraud, we are told, tens of millions of good jobs would be needlessly lost, and America would be left immobile, dark, and cold. Anxiety about job loss is palpable. But most have now seen too many anecdotal examples on the evening news of climate change unfolding to accept denial of science. The best and brightest of the captains of industry have developed more sophisticated tactics. Big Coal offers the promise of Clean Coal through carbon capture/sequester. This involves grabbing the carbon before it goes up the chimney and storing it either in water or underground. While it looks promising in controlled lab experiments, few not on the coal barons’ payroll believe that the carbon will stay put for long in its “sequester.” It’s a pipedream. Not long ago, corn ethanol was promoted as an alternative fuel by agri-business and received billions in subsidies. The result was a spike in food prices that left millions hungry and no reduction in overall carbon emissions. Today this food-to-fuel scam is now recognized as a bust not only for the environment but commercially as well. Despite the still ongoing crisis at Fukushima, and memories of past disasters such as Chernobyl and Three Mile Island, there is a major push to revive nuclear power as a profitable alternative to coal and gas. It is an alternative, certainly—but it’s not clean, not safe, and not renewable. Even if catastrophic accidents are rare, all reactors generate radioactive waste that remains dangerous for centuries. And the “rare” catastrophic disasters have deadly and permanent global repercussions. Three and half years after the 2011 Fukushima disaster in Japan, the three melted reactor cores remain unchanged in a tangled mass of hundreds of tons of highly radioactive uranium, plutonium, cesium, and strontium wrapped around and through the reactors’ inaccessible structural parts. Meanwhile, the radioactive water stored in ever-leaking tanks flows into the world’s oceans. 1) Reduced production and consumption during the Great Recession and Jobless Recovery. 2) Wide substitution of natural gas to replace coal in electricity generation. While sensible conservation measures are needed in a response to climate change, unemployment and reduced earnings of workers are hardly a good way to reduce wasteful consumerism. Natural gas produces only about half of the carbon dioxide emissions of coal when burned. While that’s qualitatively better, it is far from zero. Replacing coal with gas—trading one fossil fuel for another—hampers rather than helps a transition to clean, renewable energy sources by keeping electricity generation in the pockets of the fossil-fuel billionaires who are unmotivated to change. The switch to gas should not mitigate our concern over the emission of greenhouse gases. The widespread growth of hydraulic fracturing—fracking—has produced a glut of gas that is at least temporarily cheaper than coal. But this bonanza carries such a big environmental price—paid in the form of unbreathable air and drinking water so poisoned it can be lit on fire—that it had to be exempted from most federal environmental laws before it could be widely used. Perhaps worse, recent tests have found that 4-8% of all fracked natural gas escapes directly into the atmosphere as methane, a greenhouse gas 20 times as powerful as carbon dioxide over a 100-year period. After a decade of holding steady, methane levels in the atmosphere have climbed since 2005, when the U.S. fracking bonanza began in earnest. In his sixth year in office, President Obama is finally pressing an energy plan that purports to address climate change. While the media often refers to it as an executive order, it in fact relies largely on proposed EPA regulations that will be subject to a lengthy period for comment—and an almost certain court challenge, with a decision to be made before yet another institution designed to defend the interests of private property above all. Obama’s plan aims to reduce emissions—in electric utilities only—by thirty percent from 2005 levels. This would be done through cap-and-trade quotas administered by each state along lines set by them to reach an assigned goal. Since the 2005 benchmark allows them to incorporate the gains already registered by the economic downturn and coal-to-gas conversions, 10 states have met their goal before the program even kicks off! While Republicans have denounced the Obama plan as a new “war on coal,” a vice-president of a power company with coal fired plants in 11 states told The New York Times, “We view cap and trade as having a lot of benefits. There are important design considerations that would have to be factored in to consider each state’s circumstances. But we think it’s definitely worth looking at. It could keep the cost down. It would allow us to keep coal units running for a more extended period. There are a lot of advantages.” That sounds like more gain than pain is expected by this “newly-regulated” industry. We can expect little impact on climate change. In 1997, the late Barry Commoner, an eminent biologist who also became a multidisciplinary ecologist and social/political activist, wrote in Scientific American magazine: “The environmental crisis arises from a fundamental fault: our systems of production—in industry, agriculture, energy and transportation—essential as they are, make people sick and die. We can, of course, today add wind, tidal, and geothermal to the list of proven clean, renewable, and free for the taking energy sources. The science, technology, and conservation sketched in Commoner’s compact statement of alternatives identifies practical measures that can be done right now to halt global warming while still maintaining and even improving quality living standards. While Socialist Action supports even modest reforms, our goal is to advance consciousness and levels of struggle in the direction of the socialist future through the methodology of transitional demands. Certainly, the reforms advanced by Barry Commoner were way beyond modest. Bill McKibben, the central leader of 350.org, and NASA scientist James Hansen propose as a solution a heavy “carbon tax” on fossil fuels at the point of extraction, with all of the resulting funds reimbursed directly to consumers. Such a proposal would no doubt be more effective at reducing emissions than cap-and-trade. But even under the unlikely scenario that it could pass through Congress despite the massive political clout of the industry it targets, the carbon tax is aimed at promoting market-based reform and would not address the underlying system that is causing the crisis in the first place. This is why we call for nationalizing all sectors of the energy industry under democratic workers’ management, which would allow for novel and effective solutions to be instituted without profit-driven roadblocks. The most relevant historical analogy in American history was the emergency economic mobilization during World War II. The U.S. imperialist government did not rely on market forces to support its fighting, and that of its allies, on six continents and all oceans. It simply took control of virtually the entire economy and operated it according to plans worked out by a vast core of scientists, technicians, and functionaries. The war itself was a criminal human disaster. But the economic mobilization was the most successful crash program in history, a powerful argument for the superiority of centralized planning. We will adapt this method to use by the working class when it holds the levers of power instead of war-profiting corporations. We can adapt the organizational successes of that war-time experience to our far different goals—restructuring an economy to support a society based on ecological sustainability that is inseparable from forever ending imperialist wars for plunder and conquest. • Declare a Climate Emergency and create a new Climate Emergency Public Sector beginning with nationalization of key sectors such as Finance, Energy, Transportation, Agri-business, and Auto. • Institute a fundamental restructuring of the economy, planned by workers, scientists, and environmentalists, and managed by elected worker representatives, with a top priority of rapid, total replacement of fossil and nuclear fuels with clean, renewable sources such as solar and wind. • Dismantle the polluting, wasteful, and dangerous war machine used to support imperialism. Close all foreign bases and bring all soldiers and military contractors home. We need only mention briefly here that virtually every U.S. war in the recent past, directly or indirectly, focused on the conquest of fossil-fuel resources. Today’s U.S. military doctrine is centered on Energy Wars. • Halt and reverse land-devouring urban sprawl by renovating and repopulating our collapsed urban cores; restoring wetlands, forests and farm land wrecked by irrational capitalist “development,” and ending the need for car dependency by greatly expanding clean, safe, free, and convenient mass transit. • Support working farmers and farmworkers with livable wages and benefits and resources to shift from chemical to organic agriculture. The single biggest obstacle to winning working-class support for meaningful climate action is fear of job loss by the employed and the desperate struggle for new jobs by the unemployed. This requires applying the traditional concept of Just Transition. Whenever jobs are eliminated for the good of society, society has an obligation to support the affected workers’ income and standard of living, and to retrain and relocate them if necessary, until they can be placed in suitable new quality and environmentally sustainable jobs. Our program would eliminate millions of jobs, even entire industries. But it would also launch the biggest job creation project in history, one that would last for generations. Indeed, in a rational society, the use of sustainable and advanced technologies should lead to a decrease in the length of the workday with no cut in pay, as opposed to capitalism’s credo, wherein technological progress is inseparable from layoffs and ever-rising unemployment, coupled with more overall work hours with less pay for those remaining employed. Socialist Action continues to demand a 30-hour standard workweek with no reduction in take-home pay, as well as demanding that Social Security be strengthened, not cut, to provide earlier retirement. Nor can we abandon those in other countries who have been unfavorably dependent on and subjugated to U.S. imperialism’s ceaseless drive for cheap labor and raw materials. We must take what is needed from the greatest concentration of wealth in history, currently in the hands of the ruling 0.1%, to assist and collaborate as equal partners with the poor and oppressed in the world who are in many ways already leading the fight to stop climate change short of climate disaster. As we work to revive a fighting labor movement, educate on the need for a labor party, and support evolving mass movements such as the fast-food workers, $15 Now, immigrant rights, women’s rights, and LGBT rights, we will work to integrate these working-class forces into the climate/environmental movement. Based on the lessons of past social movements, we believe there should be periodic open, democratic decision-making conferences to determine the strategy and tactics for a united action movement for class and climate justice. Here we must also be prepared to raise and discuss issues that to date have rarely been a part of the national debate but have been made so by the extremely worthy contributions of individuals like Monthly Review editor John Bellamy Foster. Foster correctly argues against what we used to call “productivist” solutions to environmental crises. These center on the idea that a socialist society can always find a technological fix to correct any fundamental flaw in the operations of capitalism. The evidence is now in to demonstrate that the implementation of the best sustainable technology possible cannot in and of itself solve the fundamental problem. This is the simple fact that the future society of full equality that we envision cannot continue to develop along the same lines as the present society. Perhaps a clearer way to state this is that we cannot base ourselves on what exists today as the norm in capitalist “development” and, within this context, come up with a technological “fix” to change it. We cannot build the same kind of cities in poor and underdeveloped nations as capitalism has done in the advanced nations. This includes the same houses, roads, and infrastructure as well as the production of vast numbers of commodities that are taken for granted and that are readily available to perhaps half or two-thirds of the world’s people. If we expend the energy and natural resources to do so—that is, to repeat the previous paths of capitalist development—we will irrevocably breach the already dangerous “metabolic rift” between human society and nature. Living within the bounds of nature, in harmony with nature rather than furthering its destruction, is the only way to avoid doom for humankind itself. But posing the issue as we have done above raises a critical question that socialists must be prepared to answer without equivocation lest we be charged with “environmental racism”—the idea that poor nations and people are permanently barred from enjoying the same benefits of industrialization and technology as their counterparts in the developed world. That is, in the name of environmental “sanity,” so this fundamentally flawed view proclaims, the present poor must be relegated to a lesser, if not permanent, second-class status. Eco-socialists today must envision a future where all poor nations and people have free and full access to quality housing, education, medical care, technology and all other aspects of life that maximize the potential for the free and full development of everyone. How this can be accomplished is among the most decisive questions of our time.